Robert McCheyne, born in Edinburgh in 1813, had an influence on protestant Christians, through his writings, which lasted long after his early death of typhus in Dundee in 1843. Inspired by Thomas Chalmers, he belonged to the evangelical arm of the Church of Scotland and, as minister of St Peter’s Church in Dundee, he would, undoubtedly, have joined the Free Church at the Disruption, two months before his death. His most popular book, a Calendar of Daily Bible Readings (“Daily Bread”) was enormously popular. Although the Lismore minister, Rev Gregor MacGregor, kept the parish firmly within the established church, there was scope for dissent and evangelical Christianity on Lismore from the 1840s. Baptists worshipped at Bachuil; and the Congregationalists, built an Independent Chapel at Achuran around 1844, where they held a Sabbath School, superintended for 30 years by John MacDougall, weaver in Balimakillichan. In a letter to his son in Minnesota, MacDougall writes: “I hope you will be reading Mr McCheynes book your father and me very fond of it”. Dugald MacPherson came from Oban to be blacksmith at Clachan in 1870 and he was succeeded by his son Hector who worked there until 1951. This was an important book for the family and they pasted the death notices of relations and close friends on to the book covers. 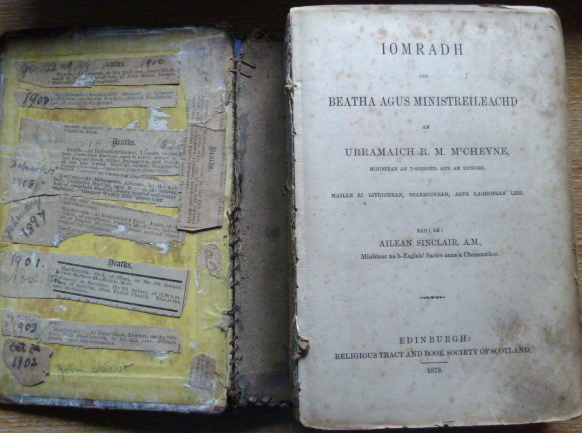 The book can be studied in the Museum archive.